Have you ever felt an urge, like there was something you should do, but you didn’t know what? Maybe it felt like you were waiting for something? I feel that sense that there is something more for me and I expect it to grow as my boys need me less and less. Recently, I began listening to the “Recapture Self” podcast, which is all about how to find your creativity and use it to re-discover yourself. I was in! I want to begin the process of re-discovering myself now – before the boys have moved out. As they grow up, they need me less and less and I have time to begin to explore what I’m passionate about and what makes me unique. Then I want to share my gifts with the world. As I take my first baby steps onto this path of rediscovery, I want to focus on reclaiming my creativity. Creativity is the life spark that makes each of us unique. Why Don’t We Try to Find Our Creativity? This TED talk from Elizabeth Gilbert got me thinking more and more about our deep need to create. She nails the reason that we don’t always seek out our creativity. Our creative adventures, and the reactions to them, are frightening. In fact, be prepared for people to criticize your creative efforts. The glare of judgment. No matter our age, is constant. Like so many of women, I grew up and became afraid of other people’s responses to my creativity. It seems so much easier to stop trying to be creative than to face criticism or judgment of our creativity. When I was young, my creativity was actually discouraged. And while we all have different experiences that may have led us to stifle our creativity, the good news it that it is still within us. We all have a need to express ourselves creatively. 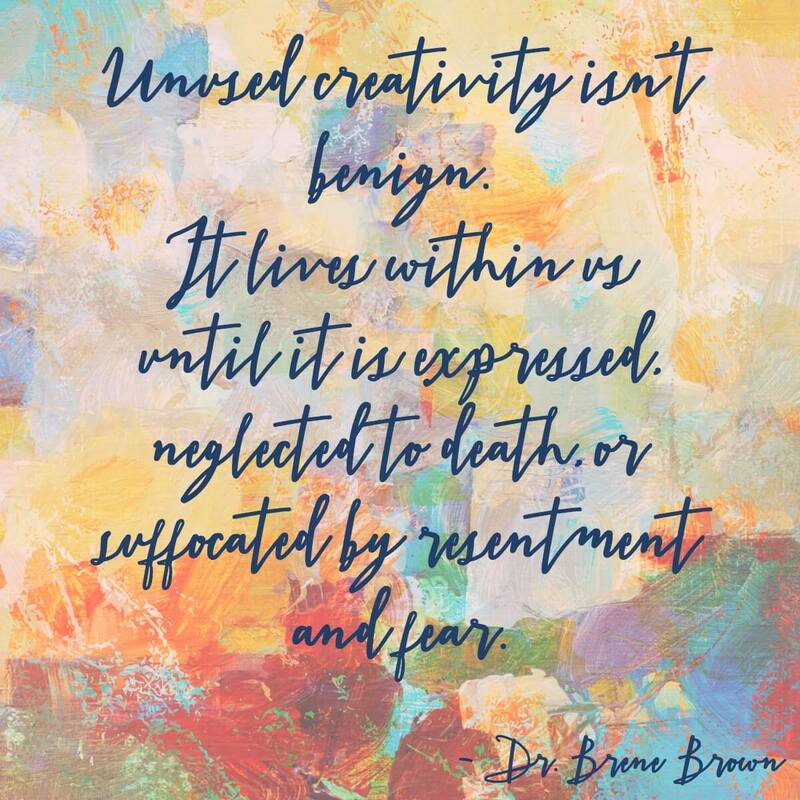 Your creativity has always been with you and I’m sure you can see ways it has oozed out around the edges of your life even if you haven’t been actively using it. For me, my creativity oozed out when I was cooking, gardening, or just changing up the look of my living room. Is it possible to find that creativity and nurture it and bring it back to health? The answer is a resounding yes! Dare to be Creative!!! Accept that you are at a point in your life where you just don’t give a f*ck what people think of your creative endeavors! You can write, dance, learn a new language, cook, garden, design, take up a musical instrument – choose something that makes your soul soar! Don’t wait for Inspiration! Just put yourself out there and try. Some days will be more creative than others! Try different mediums to express your creativity – art, pottery, gardening, flower arranging, belly dancing, teaching others something that you are passionate about – there are so many ways to express your inner creative; find a way that speaks to you. I was lucky I didn’t care that my mother thought her singing voice was better than mine. I didn’t let it stop me. To this day, I may be the world’s most accomplished car and shower singer. Evah. But, as a child, I was mocked for my creative endeavors. Knowing that my creativity wasn’t valued made me feel as if my very person wasn’t valuable. So the question is: how do I find creativity and restore my sense of value by unleashing my creative spirit if I’m afraid of how people will judge my creativity? Creativity is a muscle that you can train and exercise. And you train your creativity muscle by using it. You show up every day and use it. Some days will be harder than others, but if you keep working at it, you will be amazed at what your creativity can manifest! So, I have felt this urge that there is something that I need to be doing – something meant for me. I was surprised to find it oozing out when I began coloring (on various levels) with my boys. Now I’m trying to do one project every couple of days. Right now, they are all art. So, I’ll draw, color, or craft. I feel freedom in the process and will continue to flex my creativity muscles. I’d love to hear what you’d like to try to flex your creativity muscles!! great post! I also grew up with parents who stifled all creativity (or creativity that was different from their own ideas) and have struggled to gain that part of myself back. It takes a really intentional effort! I began to figure it out when I realized that most of the art I like is either very whimsical and child-like or really dark… So now I explore my own creativity in many ways!